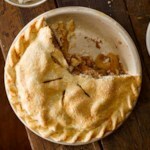 Apple butter adds to the mellow fruitiness of this pie. Dried cranberries add a burst of color and flavor. To make crust: Stir together flour, sugar and salt in a medium bowl. Melt butter in a small saucepan over low heat. Cook, swirling the pan, until the butter turns a nutty brown, about 30 seconds. Pour into a small bowl and let cool. Stir in oil. Slowly stir the butter-oil mixture into the flour with a fork until the mixture is crumbly. Gradually stir in enough ice water so that the dough will hold together. Press the dough into a flattened disk. Place two overlapping lengths of plastic wrap on the work surface. Set the dough in the center and cover with two more sheets of plastic wrap. Roll the dough with a rolling pin into a circle about 12 inches in diameter. Remove the top sheets and invert the dough into a 9-inch pie pan. Gently press the dough into the bottom of the pie pan. Remove the remaining wrap. Fold the edges under and crimp. 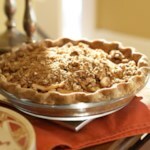 Cover loosely with plastic wrap and refrigerate while you prepare the filling and topping. 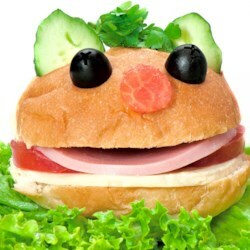 To make filling and topping: Preheat oven to 375°F. Place currants and cranberries in a steamer over simmering water; cover the pan and steam the fruit for 5 minutes, or until softened. Transfer to a mixing bowl and stir in apples, apple butter and cinnamon until well mixed. Spoon the filling into the prepared pie crust. Cover the pie loosely with foil and set in the middle of the oven, with a baking sheet placed on the rack below to catch any drips. 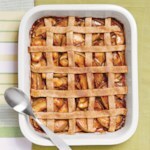 Bake for 50 to 60 minutes, or until the filling is bubbling on the edges and the apples are tender. Meanwhile, mix oats, flour and brown sugar in a small bowl with a fork or your fingertips until there are no large lumps of brown sugar. Drizzle oil and water over the top and work together until the mixture forms small crumbs. 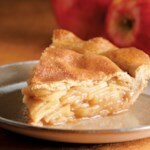 Uncover the pie and distribute the topping evenly over the apples. Bake, uncovered, for 10 to 15 minutes longer, or until the topping is golden. Serve warm or cooled. My family really enjoyed this pie. 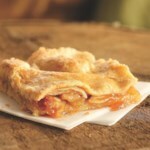 It's amazing that it's as sweet and flavorful as it is without sugar... the apple butter makes the difference. The steamed crasins and currants (which I actually replaced with rasins) go very well with the apples. I'd definitely make it again... actually, I am making it to bring to Thanksgiving dinner!